Am surprised to see the “Barrier” which existed then (as it still does) between Fossway itself and Muncastergate, the private housing street which continued from Fossway. In my day it was a strong built wall with side gate, kept locked to prevent us ‘Poor People’ from spoiling the ‘Rich Peoples’ privacy. All the Muncaster folk must have had a personal key for access, and we readily accepted the different social stratas causing the separation. It didn’t stop us young ‘uns from scaling the wall or doorway, on balmy half light Autumn evenings, scrumping the fruit that grew in abundance in their back gardens!! I am a bit puzzled now how it worked. Did everyone have a key? Or did the nearest resident act as ‘gate keeper’? Perhaps you can find out how this barrier came to be, and why in these social equality days it is still there, preventing ready access to Malton Rd. This is the view looking into Muncastergate from the Fossway side – the one my correspondent couldn’t see. The wall he remembers from the late 1930s to mid 1950s was above head height, with a locked, stout door to the left, where the square pillar stands. This is presumably a remnant of the original wall, and the blocks in the road must mark the line it once took. I noticed a similar barrier just around the corner, close to where Friars Walk joins Muncastergate. And in fact there are several of these semi-permeable barriers in the area – on Templemead, Thorn Nook and The Crossway. 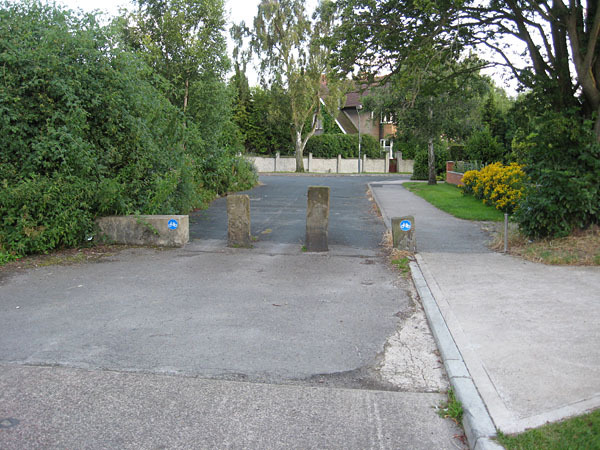 It seems that the remnants of barriers mark the original boundaries of this development of nice detached and semi-detached houses, which date from the 1920s/1930s. The 1937 map shows the development extending as far as the location of these barriers. It also shows new council housing on new roads, including Fossway, to the west and south. As my correspondent pointed out, the council housing built in York’s suburbs housed the people moved from the overcrowded ’slum’ areas such as Hungate and Walmgate in the city centre, including a large Irish community. Open fields and a golf course surrounded these two new areas of housing. Their only meeting point then was at the end of Muncastergate, the barrier my correspondent remembers. Perhaps the residents of the private housing grew nervous as the council estates encroached further onto the fields around them? Did the other barriers appear as more council housing was built to the north and west? Were they solid walls? 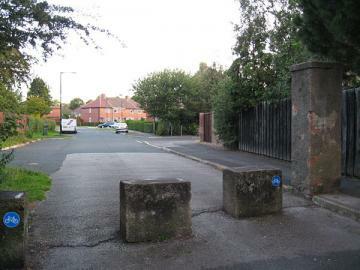 Or gates to which the Muncaster area residents had keys? Was this an early ‘gated community’? Why were the roads between the two communities joined together, but also blocked? If you can answer any of these questions, or remember these barriers when they were walls, your comments and emails would be most welcome. Go to www.old-maps.co.uk. Put these coordinates in the ‘Coords’ boxes: 461260 and 453478. When modern map appears, select 1937 map from the list on the right. Patience is required – the map looks a little fuzzy at first, but a clear version is rendered if you wait a while. A similar arrangement on an estate in North Oxford, where their walls had added spikes … Cutteslowe Walls came tumbling down. Thanks to Jim Waterson for this info. By Lisa @YorkStories • 15 August 2012 Histories To link to this page's proper location please use the > permalink. The reason for the barriers remaining on Fossway etc: is because all the roads are maintained by residents of Muncastergate and not the council. That’s interesting Joy, thank you. Does that mean you have fewer potholes I wonder. I noticed there have been many complaints about the council-maintained roads. York’s problem vehicle saturation,at bay. What a completely fascinating post – thanks so much Lisa for emailing it to me earlier on this week (and sorry I didn’t read it before now). As someone involved with York’s Housing Crisis group today – and as new housing developments are being planned – it seems very timely indeed to track back the ripples, divisions and outright exclusions generated through York’s previous waves of housing development. Thanks again Lisa. Am glad you found it interesting Helen, thanks, I hoped you might. I have to thank the correspondent who emailed me about this originally, without that I doubt I would have registered the significance of the remaining bits of wall. As there was obviously a similar example in Oxford, perhaps such physical barriers between private and council housing were quite common at one time in towns and cities throughout the UK? If anyone knows of other examples, please add a comment. I am chair of the residents committee (officially rather grandly known as the Muncaster Private Property Owners Association). The estate roads and barriers are maintained by subscription of the 109 residential households. We are currently giving consideration to maintainance of the barriers and are likely to seek a decision on any changes at the AGM in March 2015. 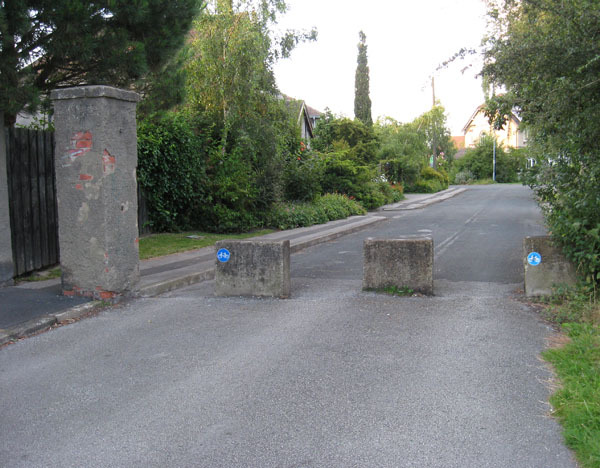 It is likely to involve a presentation and I am looking for any photographs of the original barriers. Despite extensive research on-line all I have found is your website. Have you located any photographs I could use ?? Joy is correct in her assumption, private road maintained by the residents, although the residents took some persuasion in the late 70s to stump up for a ‘Frost Covering’ ie road surfaced tarred and gritted.